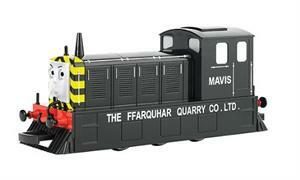 HO Scale Bachmann #58801 "Mavis the Diesel Engine" w/moving eyes! Millions of children around the world enjoy the magical world of Thomas & Friends. That's because Thomas the Tank Engine and his friends are more than just trains; they are a child's true blue friends. Little engineers ride along with the engines as they learn about life, fair play and teamwork. Thomas the Tank Engine and Friends offer little engineers a rich world to discover and explore as they recreate their favorite Thomas the Tank Engine adventure. Through these adventures, your child will learn important lessons about the value of friendship, fair play and teamwork. Add Mavis to your collection today and see what new adventures your child can create!